Numerous bushwalking opportunities exist in and around the Mitta Valley. It is the ideal base for long bush walks into the Victorian high country and Alpine National Park. Alternatively a number of walks exist around the district. 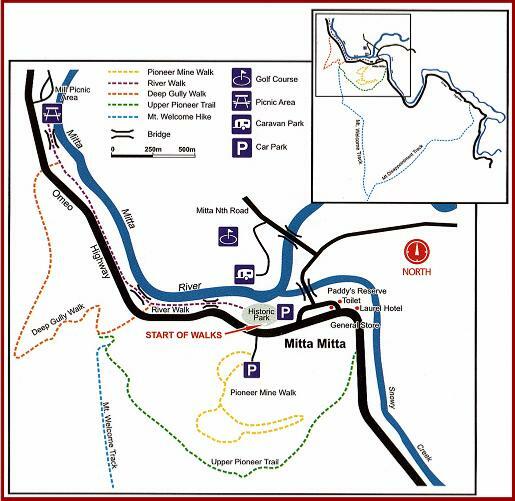 If bushwalking is not your cup of tea then why not take a stroll around the towns of Mitta Mitta, Eskdale or Dartmouth, or explore the Pioneer Mine Heritage site on the edge of Mitta Mitta. Starting Point: All walks start from the Historic Park Reserve situated at the entrance to the hamlet from the Albury-Wodonga end. Here you will find parking, picnic tables and a display of old mining equipment. Select a trail to suit your ability and time available. Familiarise yourself with the trail colours and remember to keep on the marked track.Time is estimated from an average walking speed varying from 1 to 3km per hour. Allow extra time for resting and sightseeing. TRAIL NOTES: Undulating track with steps and board walks passing through the revegetated mine site and mounds of separated rock. This large open cut mine operated (largely profitably) between 1884 and 1904 when the Federation drought closed operations. During your adventure at this site you will see the entrance to the Pioneer tail race tunnel that removed sludge from the mine under Wombat Gully to the river. TRAIL NOTES: Water caution : Keep children under supervision as this trail comes closes to the Mitta Mitta River. After the second footbridge, the walk emerges onto the Omeo Highway for approx 400m before rejoinging the river walk. TRAIL NOTES: Branching off from the Deep Gully walk, the Upper Pioneer Trail passes through a magnificent stand of Brittle Gum (Eucalyptus mannifera) and offers excellent views of the Pioneer Mine and the Mitta Valley. Keep an eye out for the myriad of water races that supplied water to the mining operations. Visitors are cautioned to stay well away from the steep edge of the Pioneer Mine. A moderately steep descent takes you back to the Omeo Highway 1km south of the hamlet. TRAIL NOTES: This walk makes an ideal circuit walk when combined with the River Walk. At the end of the River Walk follow the sign across the highway to the start of the Deep Gully Walk. The track winds through forest then traverses Deep Gully with its temperate rainforest vegetation. Once out of the Gully, the track leads through open forest of narrow leaf peppermint. Follow the track and cross the highway to rejoin the River Walk back to town. GRADE: Hard. Steep inclines. Note: no drinking water available, good level of fitness required. TRAIL NOTES: Hike climbing 625 metres follows the mountain ridge offering spectacular views of the valley below as you reach the summit (860 metres). To make a circuit walk, follow the Mt Disappointment track back down to the Omeo Highway 3.5km south of the hamlet and return along the road. • Near Omeo there are walks around the historic Victoria Falls and the Oriental Claims.